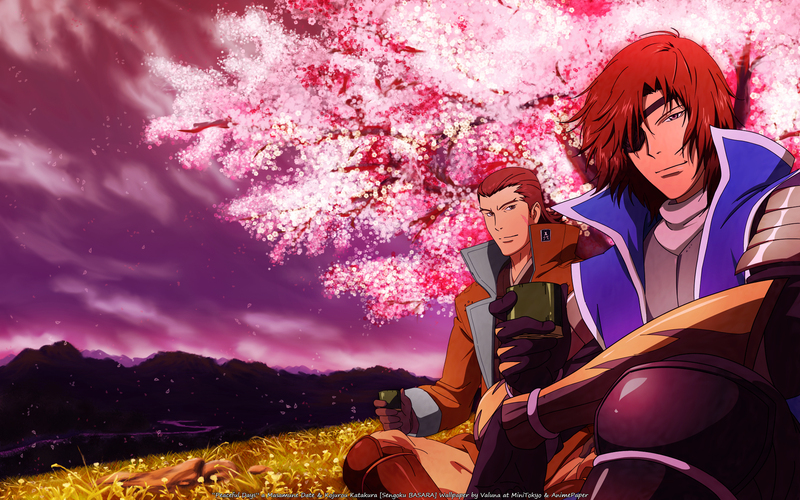 My Second Sengoku Basara wallpaper this week. I had the vector done about a month or two ago but I couldn't get myself to create a one of a failure, now I couldn't resist on creating the background as it was a lot of fun! No vector explaining 'n crap. Skipping it and going to the background! Hahaha, first I had this awful filled rough wallpaper sketch to know where everything should be placed. Later on, I had to go on a brush rampage on deviantart to get one for the grass/tree so credits from whoever they were since I have no idea which ones I actually used. Lots of smudging here and there. Everything was pretty much fun and was a decent challenge for me. No real deal to it or anything, it was most likely repeating the same thing but on another part/thing. Comments & Suggestions are all welcome! Browse Sengoku Basara Gallery: Recent | Popular. The vector outlines are quite disappointing, strokes = ewww. The bg is nice though. Nice bg, the colors are very nice and I love the perspective. about the back though...looks too mushy to really see whats going on. Though I like that it's in a painty style, doesn't have such a defined shape so it's not boring. I think you did great on the background! But I feel like the two dudes are a little detached from the bg. Perhaps if you put some grass sticking up in front of them? Or some sakura petals floating down around them, it would give them more depth into the wall. The background is beautiful, I love it. The characters do feel a bit detached though. Otherwise, nice job. Beautiful wallpaper.Incredibly refreshing with the brilliant bright colors of the cherry blossoms. omg! i love this wallpaper! its so beautiful! love the cherry blossom. it looks beautiful~~~i like sakura very much. Date sama great! Great picture! Thanks for upload!